NSPE has proactively engaged and advocated for the need to ensure that major technological, safety, and ethical implications are considered before engaging in testing and deployment of autonomous vehicles on public roads. NSPE urged NHTSA to revise its initial guidance document released in 2016, which, while not binding, will play a key role in the development and deployment of autonomous vehicles. Unfortunately, rather than strengthening the guidelines, this new version explicitly focuses on how to enable manufacturers to accelerate deployment rather than addressing the critical concerns NSPE articulated. Recognizing the promise of autonomous vehicles, NSPE has been a leading advocate on the need to place the public health, safety, and welfare first, and require a licensed professional engineer to play a key role in the development, testing, and safety certification of autonomous vehicles. 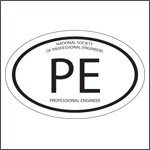 NSPE and the professional engineers it represents have a foremost responsibility to protect the public health, safety, and welfare—and to make others aware of ways that safety may be jeopardized. Given the unique technical and ethical expertise that professional engineers possess, NSPE strongly believes professional engineers can play a key role in addressing the ethical and technological challenges raised by autonomous vehicles. There is no requirement for a third-party certification of autonomous vehicles and technologies by someone in the decision chain who has a duty that puts public safety first and overrides competitive pressures– i.e., a professional engineer. These guidelines allow manufacturers and suppliers to self-certify, eliminating a critical third-party safety check. Despite encouraging results of autonomous vehicle deployments in controlled environments, there is still significant work to be done before the achievement of human-operated and autonomous vehicles safely sharing public roadways. Many factors—weather, pedestrians, road conditions—are common, rapidly changing, and highly unpredictable. The guidelines assume these hurdles will be easily overcome and do not provide adequate safety protections. The enormous ethical implications of deploying autonomous vehicles are simply not addressed. No proposed methods for addressing life-and-death decisions are provided, leaving these critical considerations up to manufacturers. A third-party incorporating the input of all stakeholders should play a key role in this evaluation. These third parties should be legally obligated to place the public health, safety, and welfare above all other considerations. The risks posed by failing to adequately address public safety protections are too great to ignore. For NHTSA to achieve its mission to “Save lives, prevent injuries, and reduce economic costs due to road traffic crashed, through education, research, safety standards, and enforcement activity,” the recommendations proposed must be incorporated into the next version, slated for release in 2018.